Police are appealing for witnesses to a two-car collision on the B2103 at Warren Hill, near Eastbourne, which sadly claimed the life of a 76-year-old woman. 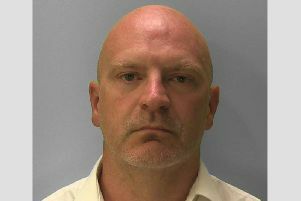 It happened at 11.34am on Tuesday (August 2) and involved a blue Volkswagen Polo and a black Land Rover Discovery. The driver of the VW, a woman from Seaford, was pronounced dead at the scene. The Land Rover driver, a 43-year-old man from Friston, sustained slight injuries for which he was treated at Eastbourne District General Hospital. Four passengers in the Land Rover - a 40-year-old woman, a 17-year-old girl, a 12-year-old boy and a 10-year-old girl - were also treated at the EDGH for slight injuries. The road was closed for several hours while the crash was investigated and the scene cleared. The East Sussex coroner has been informed. Anyone who saw what happened is asked to email collision.appeal@sussex.pnn.police.uk or phone 101, quoting Operation Bailey.